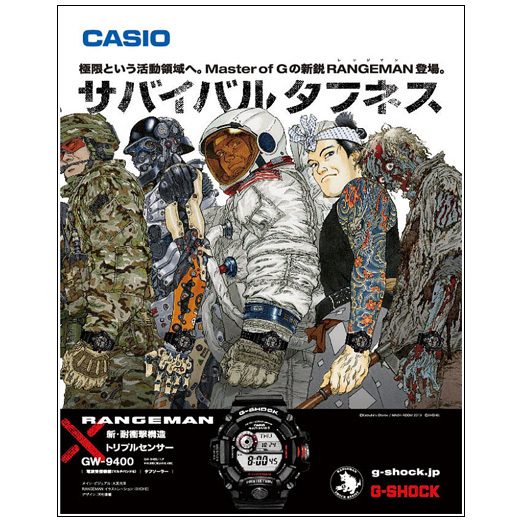 Katsuhiro Otomo has collaborated with his son SHOEI for the printed commercial of the CASIO G-SHOCK watch RANGEMAN GW-9400. Otomo was in charge of the characters while Shoei daw the hiper realistic watch. I am very surprised and don't feel I deserve this. It's a bit confusing, as I'm not that old and yet, feel old at the same time. Q2: how have the people around you reacted to this? Everyone was happy for me. It's very hard to tell if your own work is good or not. When I'm alone, I'm always confused if what I'm doing is ok. I guess that's what has been recognized in this award. I'm happy, it's like I've been told that I can continue on proceeding with my work. 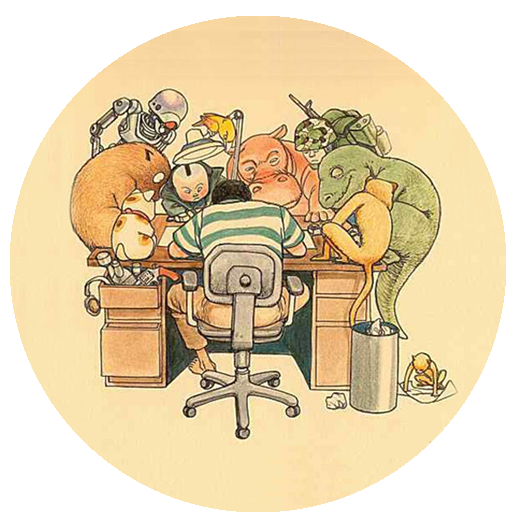 Q3: Among your cartoons and animated/live action films, hat is your most memorable work? I should say AKIRA. It was my first long-term serial publication, and I also directed the animated film adaptation. The international version was released with the collaboration of US Marvel Comics. AKIRA was probably the first Japanese cartoon released overseas. There were many aspects, which made AKIRA very memorable, such as the translation, and creating western comic books which open up totally opposite, from right to left. Q4: What message are you trying to convey though your work? It really depends on each piece such as the era in which the story takes place, and on how old I was when I wrote it. I search for themes to project in the story and the characters by getting hints from events occurring in society and my thoughts at the time. I'm always searching to arrive somewhere though my work. More than having a theme and writing for the sake of the theme. I try to arrive at that place using various methods. Q5: What kind of place did you arrive at in your work AKIRA? AKIRA first started with a very small issue, which rapidly evolved into unimaginable directions. Such phenomenon is human culture, technology and the way humanity develops. The theme AKIRA explores the gap between humans and development. I thought isn’t there something to lessen the gap between humans and their creations. Q6: AKIRA predicts the 2020 Tokyo Olympics. I totally forgot about this. A bar owner told me that I was in the news. Don’t worry, since it was just by mere coincidence. Q7: Where does your drive to create come from? It goes back to cartoons and novels I read when I was a child. I loved these books and still do. I still think about how a story should develop. I just love writing stories. I’m not exactly sure where this desire comes from. But I have been immersed in such stories ever since my childhood. Q8: Many of your works surprise people. Where do your ideas come from? It must be from going outside. Although there is a point in time when I create stories in my head, the initial idea comes from going outside, whether it be a bookstore, a CD shop, or a bar, and to just go out people-watching. That’s where I get my inspiration from. A city can really change when you don’t visit it for a while. These are sources of inspiration. Like how a city suddenly changes without you realizing it. I was in shock when I recently visited Shinjuku. Places you haven’t been to for a while become totally different. I’m inspired by a certain period of time and myself being in that place. Q9: What kind of works do you wish to make in the future? There are some already in the planning stages. Production may start soon if the budge is secured. In this sense, there are currently up to three works in the planning stages. But is also depends on if people like the movie or not. There are still other stories I want to make, so we must try planning each work one by one. This is a difficult process, but I will work hard. Q10: After your work AKIRA, Japanese cartoons and animated films became highly regarded worldwide. How do you feel about this? I have been watching US and French films ever since I was a child. We create art by viewing the works of our predecessors. We exist on top of this, and then the next generation succeeds. So I feel stories continue on in this way. So I must further devote myself to my work, to be able to have a positive influence on those succeeding me. Q11: Specifically what kind of impact do you wish to have in the future? Although I do have thoughts about how I wish to create a piece, the end product is a totally different matter compared to mere thoughts which just in your head. So it’s difficult to know what I am having an influence on… Perhaps people’s sense of the world. Q12: How do you think Japanese culture should be disseminated? There are some strange forms of dissemination now. For example, I do feel the otaku culture is a little twisted. I hope to correct this image a little more. I won’t say its bad, but I do feel this aspect has gone slightly out of control. It would be nice if we can transmit something a little more calmer. This is something we must do. Q13: Do you plan to develop your current work overseas? This is undecided. We may possibly work with someone overseas. There may be issue of how to attain funding. It’s still up in the air. Q14: You’ve been active in various fields. What are the differences between Japan and overseas? I’ve known that it’s tough working in the movie-related industry in the US. For publishing, it’s easier to work in Europe than in the US. I would love to go. I did try to a long time ago, but always end up not going from being too busy with work. It would be pointless to go for a short term period of just one month. I did seriously consider it once, but never had the chance. Q15: Please give a message for young people aiming to become a cartoonist and director like you. If you want to make a piece, I think it’s important to know the vastness of the world. The world is vast. You should expose yourself to novels, culture and art. Try to see and read as much as you can to be able to store this information in yourself. 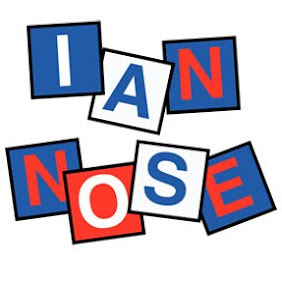 Although this requires effort, it’s very difficult to reach an individual form of expression if you don’t do this. So please work hard.